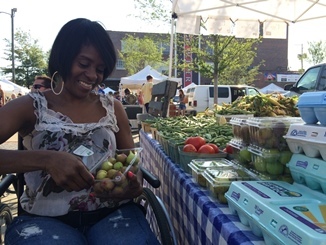 As the dietitian for the National Center on Health, Physical Activity, and Disability (NCHPAD), part of my job is to create nutrition toolkits with kitchen adaptations and healthy recipes to help people with specific disabilities live a healthier lifestyle. The ADA has made it possible for organizations like NCHPAD to help and encourage people around the world to become healthier. Now, people with disabilities can shop for their own groceries in stores with available customer assistance, motorized shopping carts, and wider aisles big enough to fit a wheelchair. Some stores even provide grocery carts that are designed for parents and caregivers of special needs children. Although we’ve come a long way in the past 25 years, I believe that we still have a ways to go to make health and wellness easily accessible to all people with disabilities. For example, food journaling is known to be a helpful tool for people trying to lose or maintain weight. The creation of diet tracking apps on smart phones has made this tool more easily accessible for a lot of people but not everyone. Many of these apps have a component that estimates a person’s daily energy expenditure so that they can make sure not to exceed the number of calories recommended that they consume. For those with a spinal cord injury, amputation, or a disease/disorder that impacts their energy needs, these types of apps are not appropriate and may under- or overestimate their calorie needs. At the moment, researchers are working on innovative programs and technologies that could be the answer to overcoming numerous health barriers specific to people with disabilities. I believe that the ADA, as well as the Paralympics and Special Olympics, have changed peoples perspective on the health of people with disabilities. Just because a person has a disability doesn’t mean that they are sick! I work with a number of people with physical disabilities so I see how able a person can be despite their disability. All it takes sometimes is a little encouragement and instruction. What part of the ADA has improved your health? What barriers keep you from reaching your optimal health? Nutrition has no doubt been so important to my growth as an athlete. More importantly, as a person who seeks independence, being able to access shopping areas is important from a day to day standpoint.